Editor André De Quadros has invited some fine experts in various fields of choral music to contribute to the Companion. 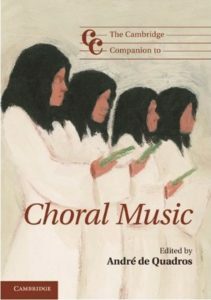 The present publication consists of 19 chapters which include a handful of key topics within the choral arts that are often missed in similar books. There are three sections: ‘Choral music: history and context’; ‘Choral music the world over’; and ‘Choral philosophy, practice, and pedagogy’. Several prior publications have dealt with these themes independently, but the Companion brings them all under one cover. After a brief foreword by John Rutter, de Quadros first defines what we mean by choral music. He then states that his threefold aims are: to put choral music in a historical perspective, to display and celebrate the wide diversity of choral music globally, and to honor choral activity and contribute to its advancement. Contributors in Part 1 include Andrew Parrott, Chester L. Alwes, Nick Strimple, and Paul Hiller. These first four chapters describe the rise and formation of choral ensembles, mentioning the main composers, genres, important geographical centres, political or historical figures, and events affecting the path of choral music. Alwes begins the third chapter, Choral music in the culture of the nineteenth century, by exploring the philosophical engines of the eighteenth century, including the Enlightenment, and the Industrial Revolution, during which thinkers like René Descartes, John Locke, Isaac Newton and Jean-Jacques Rousseau took their stance. Strimple brings us up to modern times in the fourth chapter, ‘Choral music in the twentieth and twenty-first centuries’, covering the development of polytonality, impressionism, eclecticism, dodecaphony, nationalism. He concludes by examining certain advancements emerging at the close of the twentieth century, and describes how music from areas like Mongolia and various African countries gradually became more accessible. Chapter 5, ‘The nature of chorus’ is by Hillier, who encourages us to rethink why people sing in vocal ensembles. His prose is like a train journey, as he stops off to visit places where singers are found, examining on the way opera and oratorio choruses, church choirs, folk groups, and concert choirs. This is perhaps the most provocative chapter, and makes the reader think of what the future might hold. The second section, Chapters 6- 13, devotes itself to choral activities around the world. Each author, an expert in a particular region, takes a slightly different angle. Of most interest perhaps are the chapters devoted to the music of indigenous peoples and how it has contributed or affected the course of choral music where they live. Some statistical information on population percentiles participating in singing is also included. And all prominent ensembles and important choral centres are covered, the focus being on the dissemination of choral music itself. The final section of this book, ‘Choral philosophy, practice, and pedagogy’, are by Francisco Núnez, Mary Goetze, Cornelia Fales, Wolodymyr Smishkewych, Doreen Rao, Mike Brewer, Liz Garnett, Ann Howard Jones, and Simon Carrington. These are case studies which address different aspects of practice or pedagogy or both. The development of audience and ensemble diversity is an issue here. The question is asked as to how singers may best be exposed to repertoire calling for a vocal timbre other than that used for bel canto style. The training of upcoming conductors in the twenty-first century is also covered, as is the idea of individuality in our ensembles, discussed well by Brewer and Garnett who aptly describe this as a “microcosm of human social life”. De Quadros and all his contributors are to be commended for this all-embracing compilation of articles. It is a ‘must read’ for all conductors, music organization committees and boards, tertiary music programmes, and singers alike.